﻿ U Inchantree Kanchanaburi Hotel (Thailand) | FROM $66 - SAVE ON AGODA! "Plenty of parking Great view by the river at the restaurant." Have a question for U Inchantree Kanchanaburi Hotel? "Great location (5 mins walk to River Kwai Bridge)." "The hotel is pleasant and quiet with great view of River Kwai." "I love this hotel very nice and friendly"
"Love the place and beautiful room"
Open spaces, extra large rooms, and a small number of rooms work in favor of U Inchantree Kanchanaburi Hotel. With 24 guestrooms and 2 suites, noise and crowds will never be a problem at U Inchantree Kanchanaburi Hotel. 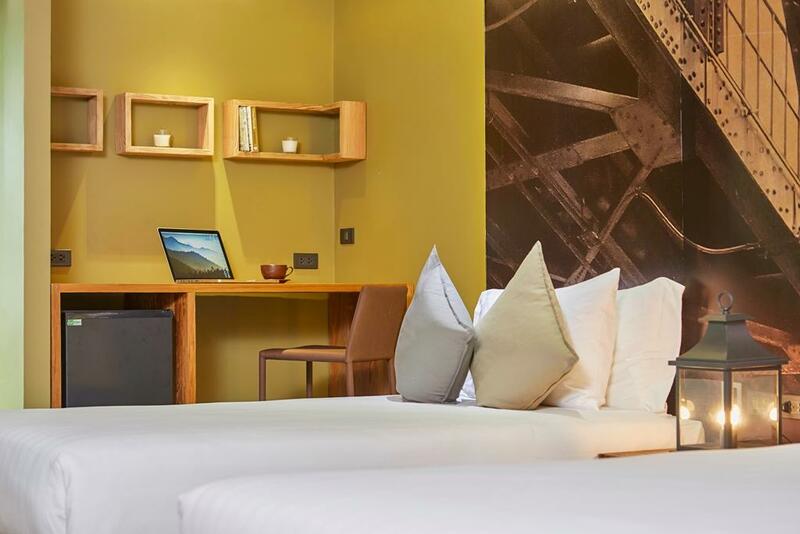 All rooms come delivered with high-tech conveniences and amenities, sweeping guests straight into fantasy. Perfectly set in the heart of town, this is an ideal location for exploring most of the city’s cultural sights and attractions. There are numerous local markets, shops, and shrines surrounding the hotel for a truly cultural experience. 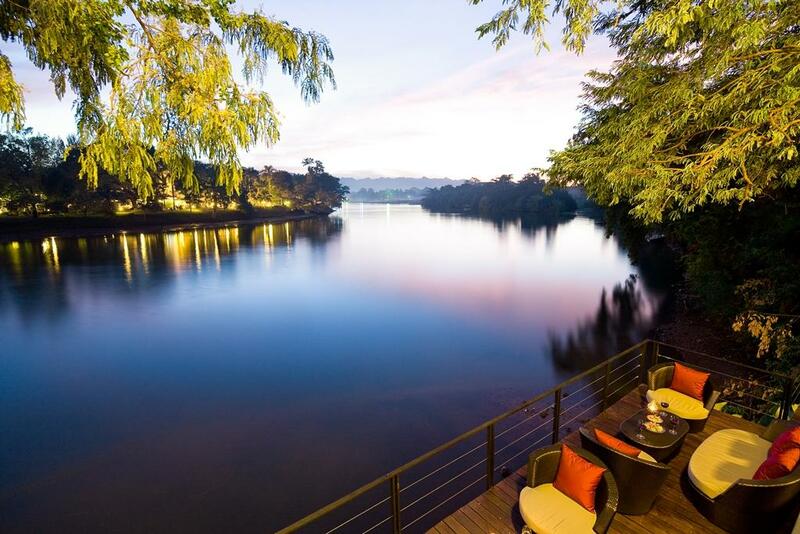 Guests can enjoy freshly prepared cuisine at the onsite restaurant with spectacular views of the River Kwai. Offering quality accommodation and the finest service, U Inchantree Kanchanaburi Hotel is an ideal place for a memorable stay. "The infinity pool is a blessed relief." Modern hotel in good location north of the railway bridge, just at the bend of the river. Wonderful views, especially in the morning and in the evening. Great breakfast buffet with many healthy options. Friendly and helpful staff. It is value for money as we have a huge room. The pool and gym is really small but breakfast area is nice as it is beside the river. Overall is nice but we do encountered water disruptions for a short while in the morning. Usually I trust agoda reviews and generally I side with the more positive reviews, but on this case I can't understand the great reviews. This is a case of great interior design and a well run, well staffed hotel not being able to change the physics of the structure of the building itself. The rooms are very small and the structure is essentially that of stacked portacabins with truly paper thin walls;; one can hear absolutely everything from outside and neighbouring rooms. There are now nicer hotels.nearer the town for half the price. Well done to the staff for almost pulling this off, but I'm sorry I have to rank this as one of the worst value hotels.i have stayed in. This hotel is by far my favorite in Thailand and probably the world. My wife and I have spent 40-50 days in the past 6 months there and usually 5-7 days at a time. The staff is amazing, service is 5 star, the food is absolutely wonderful (Breakfast buffet is perfect), and rooms are very clean and nicely designed. I had to stay a few days at another hotel due to 2 of my days not available (Book early as weekends they are full) and the other hotel had nice rooms but nothing close to the service or amenities at this hotel. U Inchantree is worth every baht spent on the room. You will not find a better hotel or staff for the money in Thailand. I have never had one complaint about this hotel ever. The food was fantastic, Great thai chef. The reseraunt on the river was very nice for breakfast. The room I stayed was to small for two people so pay attention to Sq meters, they had bigger rooms that would have been a better experience. The rooms are not along the river so not much view from the window, but there are terraces on the river that were very nice to sit and relax. Stood at the Hotel from Saturday till Tuesday. The Hotel is in a unbeatable and beautiful location. Arrival staff very professional and the Peppers restaurant. But be aware about the "rooms fully booked" answer. We made a booking from at the Hotel from Bangkok and move it to Saturday the answer was fully booked even we got a booking. Then we want to extend our room for 1 night or maybe even more nights, but the answer fully booked came again. The sadest part is that the Reception desk is such unprofessional to use this sentence in every conversation. A sorry also did not exist in the vocabulary which I have not seen very often in the hospitality business. We eventually found a room over Agoda and booked it over them as the hotel could not help at all. Paid also for the extended night 50% more then I booked over the Hotel. In my eyes the Hotel is the best in Kanchanaburi but lack of the reservation and hotel booking staff did not impressed me at all and ruined my break from Bangkok. We had a fantastic stay here. The rooms are slightly on the small side but are immaculately clean. You are offered a welcome drink which is basically a free choice from the mini bar, which we really enjoyed. Relaxing by the pool and by the river is wonderful. The breakfast is one of the best we've had in Thailand. The sausages are real western sausages rather than those horrible hotdog style sausages. It’s well located with a good view of the bridge. The room is very big. They prepare extra bed for us for the kids. Breakfast was excellent. A lot of choices. Dinner was good. But we were taking for an hour for food to serve When they were only 4 table to serve. The food taste was great. We stayed in a family room at U Inchantree. The room was spacious and spotless. The free drink each from the minibar and the fresh fruit on checkin was a generous touch. Breakfast was awesome, especially if you can sit down on the verandah by the river. The pool area is nice and relaxing and the gardens throughout the property were beautiful. Although we checked out around midday we also thought the flexible check out was good feel. All round we had a wonderful stay. Pros: Location, location, location. Plenty of parking Great view by the river at the restaurant. You can see The Bridge. Use of bicycles that are well maintained. Friendly staff. Good food at the restaurant Cons: No view from rooms Restaurant is pricey Accommodation is a bit small. We booked a suite room and it was nicer than expected. They are very detailed with amenities and facilities. Nice staffs and great service. The breakfast is quite standard though not that impressive. The water runs very unstable but so far so good. This place will definitely be the first choice when i come back to Kanchanaburi. Everything was a pro, we could not fault one thing, this place was not only beautiful and tranquil, every staff member were friendly and pleasant and only to happy to accommodate any request, highly recommend a stay here. only about 300m from the bridge. serene environment, good service. our room being the cheapest category is tight but ok for 2 nights. we were out most of the time, only came back to hotel to sleep. Beyond the satisfactory facilities. The water system is terrible. We weren't able to control the temperature of water for shower at all. Extremely hot and chilling cool. it was due to the water pressure too low and not stable. the housekeeping didn't do what they should do, such as cleaning the floor, change towels, refill tea or coffee packs, etc. It's not good, The location is far away from downtown. If you wanna go to the night market, you have to go there by yourself. We went there by riding bikes. It's so dangerous and far. Stayed at the property on Sep 1, 2018 for a night. Upon checking in, we were upgraded to a Suite (originally booked a Deluxe). The check-in process was fast. Although welcome drinks (which we were expecting) were not offered, cold towels were provided. The room is spacious and the toilet amenities (especially the soap) are lovely. Staff are friendly - we were welcomed with a genuine smile. They also escorted us to our room and gave us a short introduction of how tv, switches operate, which is a really nice gesture. The location of the hotel which is next to the river is fantastic. The pool is small but lovely, you can swim and enjoy the river view. Breakfast, although limited, are of good quality. In overall, would recommend this place and come back if time permits. We had stayed in the larger rooms on a previous visit. Spacious and worth the money. The smaller room we stayed in this time was not such a value. Too small afor the price. I'll go back for the big room, the helpful staff and the excellent breakfast. If you expect peaceful stay, this is the right hotel to stay. just 1thing I care was.....I found a..... spider web from the room so seems like housekeeper fail to spot it during cleaning. Also even when I turned on every single light in the room, still feel little bit dark. I could not open the curtain as it was faing hall way. Deluxe room was big enough, bathroom was also modern design, super clean I liked it. Definately visit again.